‘You like gardening – review this,’ so said the Readings DVD buyer. Yes, I do like gardening, though I’m not a keen documentary watcher. 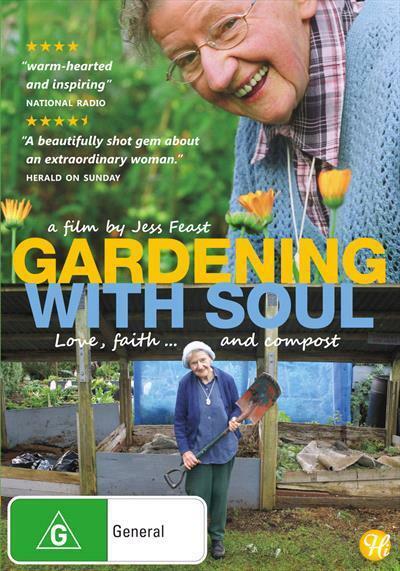 But my protests fell on deaf ears and I found myself spending a Sunday evening watching Gardening with Soul, a feature-length documentary about Sister Loyola Galvin, head gardener at the Home of Compassion convent in Island Bay, New Zealand. I was expecting to pick up a few gardening tips (I did learn that mixing seaweed into your compost is a good thing), but the gardening element is more a backdrop for the story of a very extraordinary life. The documentary is broken up into the four seasons, beginning with the winter of Sister Loyola’s ninetieth year. As she potters around, she explains what needs to be done in the garden each season while reflecting on her life. She tells of the special bond with her father, her determination to become a nurse during the war, of losing the love of her life and of making the decision to become a nun. We meet some of the people she has influenced over the years, as a carer for disadvantaged children and as an advocate for community gardens. In the end, I did enjoy watching Gardening with Soul. Sister Loyola is a spirited, lively old lady, who isn’t afraid to say what she thinks. She denounces child abusers, both inside the church and out. I remember a particular moment when she likens children to young seedlings, saying if they have a bad start in life, they struggle to thrive. This is a heart-warming documentary that you don’t have to be a gardener to enjoy – there are little pearls of wisdom for everyone.